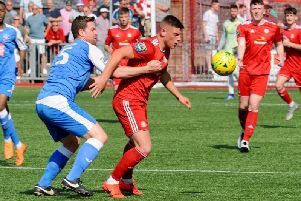 WORTHING Football Club joint boss Gary Elphick says his sights are now firmly set on finishing top of the play-off chasing teams. Elphick has conceded that his side will not catch Ryman League South Division leaders Folkestone Invicta, after a 3-0 defeat at Hythe on Saturday left Rebels 14 points behind the Kent side, who also have a game in hand. Rebels are second and Elphick wants his side to finish as runners-up to ensure home advantage in the play-off semi-finals and also a potential final. Elphick said: “We’ve got to win our mini league now and what better way to start than against a play-off rival and in-form team like Herne Bay at Woodside Road on Saturday. “That’s our main aim, we are two points ahead of Dorking, who have a game in hand, but I’d rather have the points on the board. There is pressure now and we’ve got to show whether we’ve grown up or not now. Rebels had a frustrating afternoon at Hythe on Saturday. They trailed 2-0 at half-time and then hit the woodwork twice after the hosts had been reduced to ten men early in the second half. Hythe then added a late third on the break. Hythe went ahead when Alfie May headed home at the back post, before Worthing striker Ben Pope was denied an equaliser by Hythe keeper Joe Mant. Mant then kept out a shot from Lloyd Dawes, before the hosts doubled their lead just before half-time when May grabbed his second after a solo run. Hythe’s Nick Reeves was sent off for a foul on Pope early in the second half and Rebels twice went close to getting a goal back. Dawes struck the bar from Will Hendon’s cross, before Omar Bugiel’s shot came back off a post. Dawes then got through on goal but Mant produced a superb save, before Hythe added a late third on the break through Jack Mahoney, who tapped the ball home after Rebels keeper Rikki Banks kept out Frankie Sawyer’s shot. Elphick said: “We definitely didn’t have lady luck on our side but we left ourselves with a mountain to climb. “We didn’t start overly well and away to teams in Kent, you’ve got to be strong and physical and we weren’t. We just had too many players off their game on the day. Rebels entertain fourth-placed Herne Bay on Saturday. Worthing could give a debut to winger Ira Jackson, who has signed from Whitstable. Elphick said: “He’s got rapid pace and scored twice against us in the opening 15 minutes of the FA Trophy game earlier this season. WORTHING: Banks; Hendon, Elphick, Heath, Metcalf; Dawes, Richefond, O’Neill, Sparks; Bugiel, Pope. Subs: Axell, Quirke, Piper, Fagan.